Do it! Do it for design futures! Go! Go! Go! Hello, friends! One of my current projects involves the future of human longevity. 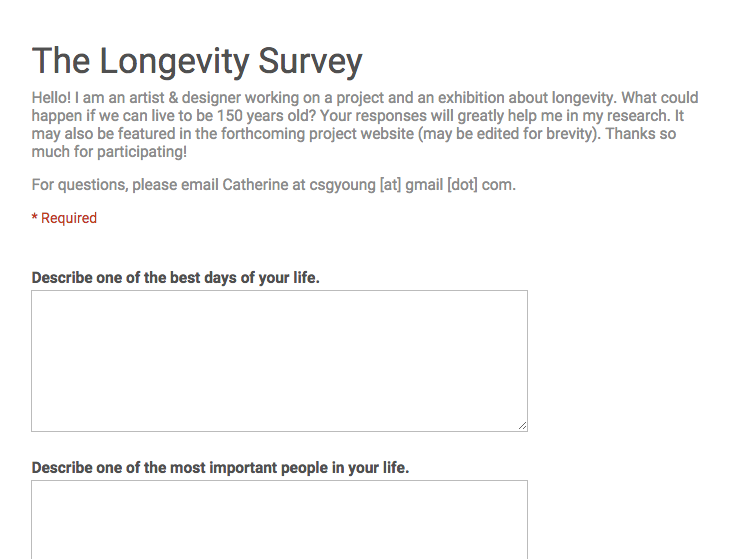 I’d be so grateful if you can please answer this survey on Google Forms. Thank you! The past year or so has seen me venturing into the mysterious field of “speculative design.” In The Apocalypse Project, I’m trying to see possible futures under climate change, which are generally not pretty visions of tomorrow. When it comes to something as dry and political as climate change, the best way to get people to care is to let them find a personal story. Climate change is humanity’s story, not just a few individuals’. It is also complex and multilayered; a photo of a melting glacier might trigger the emotions of people living near them, but it might not be as effective to a person who has never experienced a winter. Here in Southeast Asia, I notice that people paid more attention to stories about rising sea levels, extreme heat or supertyphoons, because those are the things that they have personally experienced and have something to say about. However, this isn’t to say that people in the tropics will never care about polar bears. I think that another property about the climate story is that so many things are connected—a melting glacier may further alarm people who are experiencing drought, for example—and there are opportunities to connect these dots that people never realized existed. 2. The power belongs to the people. When people want to buy these hypothetical products, I’m taken aback and get a conscience attack of sorts. My goal was to show people how bad it could get, but instead people’s consumerist tendencies prevailed. But then, why wouldn’t they want to buy these? I had made them so real that they only thing that was missing was a PayPal button. I realized the power of people as consumers; the exchange of money for product allows for the existence of these objects. These transactions keep these products—and the ideas behind them—alive. If people refuse to buy the product, then it marks the end of it. Should I sell these? This is something I keep thinking about. Perhaps letting people buy them allows for even greater awareness, as long as they know the intentions behind it. Let me get back to you. 3. The true test is converting a denier. The bulk of the people who have emailed me or tweeted about how the like the project are usually futurists, artists, or other people who are already aware of climate change to begin with. While I’m extremely grateful for this, especially for the future collaborations that it could ensue, to put it bluntly these people are already smarties. The next cohort of people that I’ve impacted are the “laymen”—those whose work has nothing to do with design or sustainability, but are folks who can see their personal stories in these projects. I think this is wonderful because I’ve always wanted my designs to exist beyond, well, design. Children have always been among my primary—and usually the sharpest—audience and I usually prototype my ideas on them to see if I’m being too unnecessarily confusing. Perhaps the pinnacle of “success” in doing projects like this is when I am able to convert a climate change denier. This is the final cohort of people who are going to be the hardest to convert but are those who will give me the greatest pleasure to impact. When the initial wave of press for my projects hit, I get trolling tweets from climate change deniers literally seconds later. It’s usually how I know that my projects are being written about. I would often joke to my friends about how they’re usually just a bunch of old white guys, usually in the US, who’ve never experienced the scale of a tropical typhoon and probably don’t get out much anyhow so who cares. I never engage in them, but the more I think about it, these are the ones that, if converted, means that I was extremely effective in conveying ideas. But I just think they’re so gross. What to do, hmm. Any ideas? 4. Everyone can contribute to this. In Future Feast, I got a bit floored towards the end because I truly felt that it was transformative for a lot of people. Having multiple talents together—musicians, artists, designers, scientists, etc.—can feel like high school because they have very different personalities, and I as the one behind this was a bit anxious that the dots wouldn’t connect because everyone had their own vested interest in the project. However, I realized that it was in this multilayered experience that gave people a meaningful experience. In the end, it was great to feel that it wasn’t just my project anymore—it was everyone’s, which was the point. I’m still evaluating the impact of the work I’ve done in the past few months. Stay tuned here for updates on what’s next, and thanks so much for keeping up with the projects!